Mobile instant messaging application Palringo is now available on the Android Market. 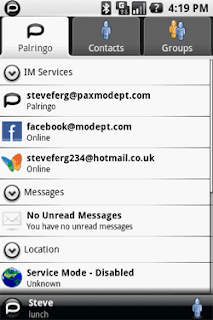 Using Palringo, Android users can chat to their friends on Google Talk, MSN, Facebook, Yahoo! Messenger, AIM, iChat, QQ and other popular messaging services and social networks. Android users can share their location with friends on Palringo: buddies can see each others’ location and proximity (distance away) alongside their status in the Palringo contact list. Users may also view a map showing the whereabouts of all of their contacts who have chosen to share their location. Palringo for Android runs in the background on the phone and notifies the owner when they receive new messages from their buddies. This means they need never miss a chat message.